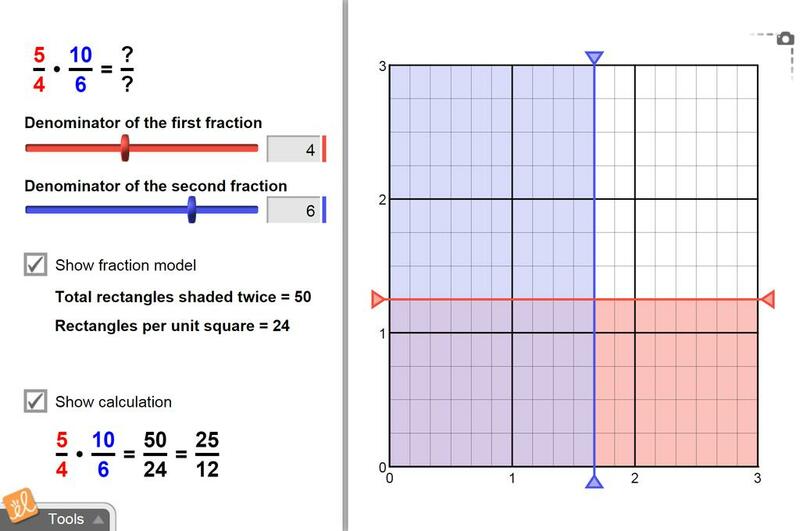 Multiply two fractions using an area model. Vary the vertical area to change one fraction and vary the horizontal area to change the other. Then examine the intersection of the areas to find the product. This document is the French translation of the Student Exploration Guide for Multiplying Fractions. This ... (more)translation was made possible by Alberta Regional Professional Development Consortia and ExploreLearning. This document is the French translation of the Assessment Questions for Multiplying Fractions. This tran... (more)slation was made possible by Alberta Regional Professional Development Consortia and ExploreLearning. by S. McMurra;, DDSB, ON - Students identify the visual representation of the numerator and denominator o... (more)f a product. Activity includes a practice chart and application question.